Stream all your movies, home videos, television shows and music to all your devices with Plex Media Server. 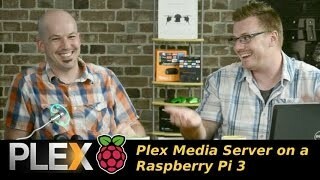 We'll show you how to install it on a Raspberry Pi 3 micro computer, giving you a powerful little Plex Media Server for a fraction of the price of a similarly-spec'd dedicated system. As I sit here at my desk, I have a super cool clock fan blowing in my face, keeping me comfortably cool. According to the weather reports, it "feels like" 35°C (95°F) in Barrie today, so it's kinda great timing. Pun intentional! This week on the show, we covered more than just nifty nerdisms! We finally solved the mystery of that crazy backplane looking thing in Jeff's new computer, celebrated Jeff's birthday with a little sumthin sumthin from House of Marley (here's a hint), and also got to play with the Raspberry Pi 3 once again! This time, the quest was to turn that Raspberry Pi 3 into a smokin' little Plex Media Server. No more having to convert your files to play on your Western Digital set-top box! Now you can stream your video and music files to any device with the Raspberry Pi 3 acting as a hoppy little transcoder unit, ensuring it only streams compatible versions of your content... by converting it on the fly! I truly hope you enjoy the show, and thank you so very much for supporting Category5! 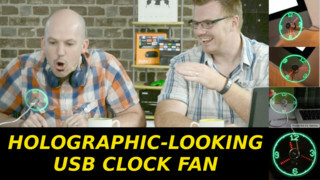 Geek Toys - The Clock Fan That Looks Positively Holographic!